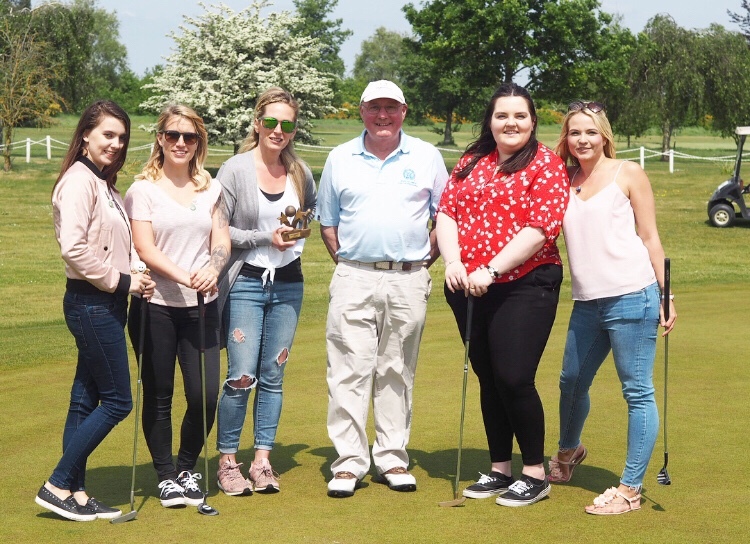 Last Friday I was invited along to Parley Golf Centre for a little introduction to golf session with some of the other local bloggers in the area. Although a few members of my family are keen golfers, and Ed and his parents also enjoy the sport, I have never properly been on a golf course before and didn’t overly know what to expect from the day. I went along with Louise, and we met Ciara and the lovely ladies behind Two Mama’s Mayhem Elle and Kelle when we arrived at the centre. We were greeted by Lynsey, who handles the marketing for Parley Golf, and taken to a table in the cafe where we were offered a glass of Prosecco, and some delicious bacon rolls whilst we were told what would happen throughout the day. Lynsey introduced us to one of the centre’s very own coaches, Marcus, who was lovely, and would be leading us through the rest of the day whilst teaching us some skills. We were given badges and led out to the driving range where we would have the first session of the day. Marcus talked us through some safety announcements, before explaining about the clubs we were using, and giving a demonstration on how to swing the club in order to get the longest range for our balls. I was totally rubbish when I first started, my ball was barely getting any distance at all, but after a few tips from Marcus about hitting the tee rather than the ball, and angling the club differently, I was getting a much better swing and I was really proud of how much I improved in such a short amount of time. After we had used up our balls, we were shown a different club, the driver, and took it in turns to swing and then hit some balls in preparation for a little distance contest. Kelle won by far (mine barely went any distance at all, despite initially showing promise on my practise swings), and we all headed over to the green to try our hand at something else. Marcus gave us each a strange tube, which he explained was used to pick up the balls quickly and easily, without needing to bend over constantly. We were a little like children with them, chasing each other to pick the balls up first – so mature! Marcus was a really good sport, and totally put up with our antics, and our constant photo taking throughout the day. After we had a couple of goes at chipping, Marcus led us over to a very well manicured area of the green, which was dedicated to putting. We were organised into a circle, and tried to get our balls as close to the hole as possible. By some fluke, I managed to get a hole in one straight away. Unfortunately it seemed I peaked too early, and spent the rest of the time trying to get my ball anywhere near the hole again! It was a lot of fun, especially when we did a second little contest, to see who was the best putter, which Louise won (I was knocked out in the second round sadly). Afterwards, Elle and Kelle had to rush off for the school run, but Louise, Ciara and I got to have a go on the golf buggies, which was so much fun! They are actually a lot easier to drive than I thought they would be, and we enjoyed manoeuvring them around and posing for photos before it was time to go home. I had such a lovely time at the centre, and I would never have thought that golf would be something I enjoyed so much, but I am looking forward to going along again in the future, and improving on the skills I learnt with Marcus. I know that the children would also enjoy the sport, and I plan to take the older two along at some point soon. As well as membership options, the centre offer pay and play sessions, tuition and access to the driving range. I was invited along to Parley Golf Centre, however I was under no obligation to write this post, and all photos and opinions are my own.